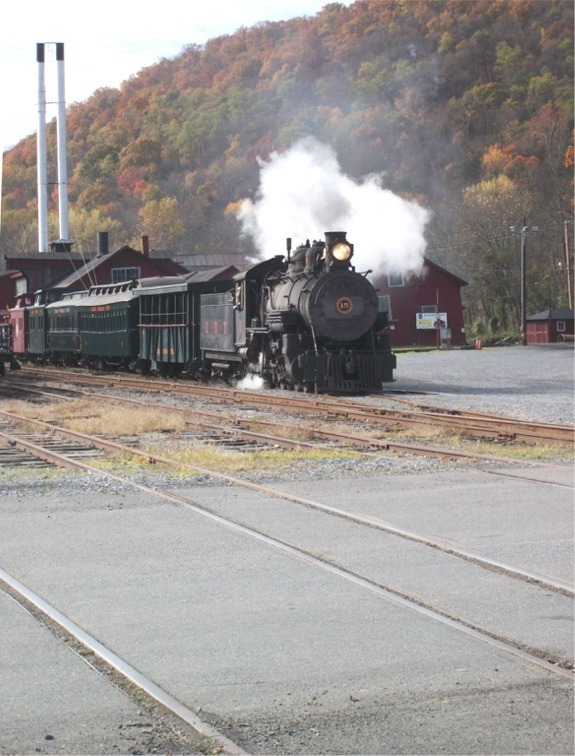 On Friday, I visited Rockhill Furnace, Pennsylvania, to ride the East Broad Top Railroad (EBT). In fact, I was to be an “Engineer for an Hour.” This EBT program, for a fee, allows one to ride in the cab on a regular trip over the tourist road and, for a few brief moments, to actually run a narrow-gauge steam locomotive. I had been preparing for this trip for a while. Certain clothing—leather work gloves, boots, etc.—was required, and some other items seemed necessary to fully participate in the experience. I collected my outfit for the day over a couple of weeks, and I replaced my old engineer’s cap only the day before I arrived on the EBT property. I had to arrive by 9 AM for a pre-trip briefing. I didn’t quite know what to expect of the briefing, but I assumed that there would be some instruction on steam locomotive fundamentals, including operating procedures, and a good deal of talk about safety. I was directed to the roundhouse, where Mikado No. 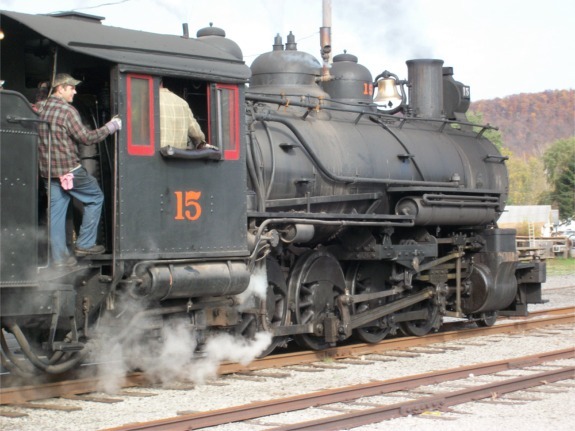 15 (BLW #41,196, 1914) was being fired, oiled, and inspected for the 11 AM trip. My briefing consisted of a quick trip to the cab, where I was shown the Johnson bar (i.e., reversing lever), throttle, and valves for the train brake and engine brake. Apparently, it was assumed that anyone who had signed up to be Engineer for an Hour already knew something about locomotives. There were no safety instructions. Engineer’s side of the cab. My briefing was here in the roundhouse. A work light provide illumination. No. 15 being readied in the roundhouse. 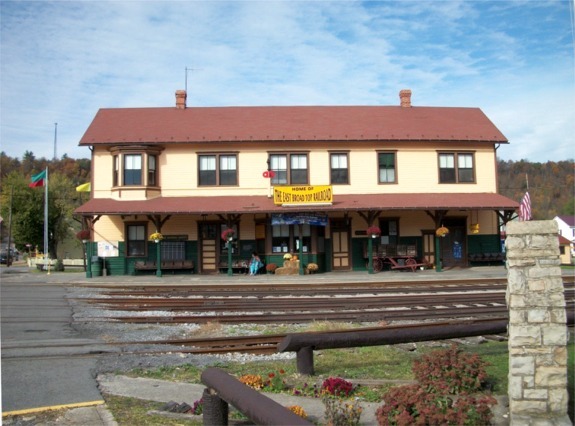 Soon enough, the train was on its way to the station, where a handful of passengers were waiting to board. Train approaching the station for the 11 AM run. I boarded the locomotive shortly after it reached the station. No. 15 nearly ready for departure. I had expected the cab to be somewhat cramped, given that the gauge of the EBT is 3 feet. 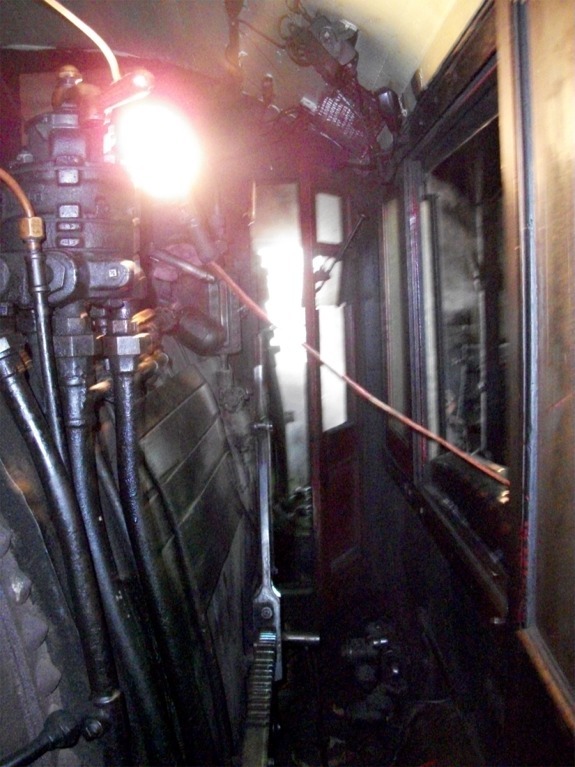 There was little room between the firebox and the side of the cab. This locomotive was not intended to be operated by obese engineers! A particularly odd feature was the fact that the firebox door was at the very back of the cab. In some ways, I suppose, this was convenient; one could fire the locomotive standing on the tender, scooping coal from the bunker, and simply pivoting to throw the coal into the firebox. The train ran about 5 miles, turned on a wye at a small park where it stopped for a few minutes, and then returned to the station after turning on another wye. On the return trip, I got to sit in the engineer’s seat. This was fun, but I had no intuition about what I should do. The locomotive had no speedometer, and the grades were hard to discern by eye. 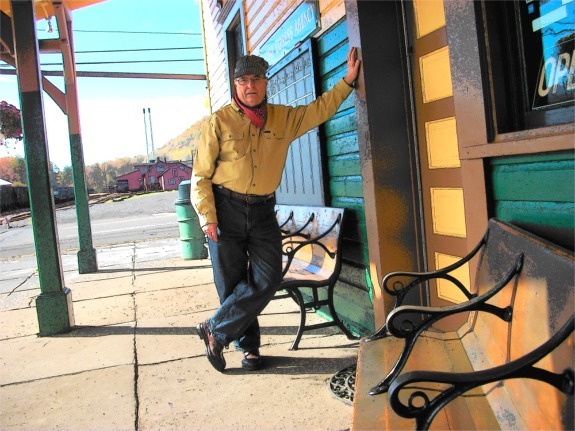 I couldn’t even determine for myself when to blow the whistle; there were no signs announcing upcoming grade crossings.Without crossing my fingers, however, I can say that I once controlled a real steam locomotive in revenue service. 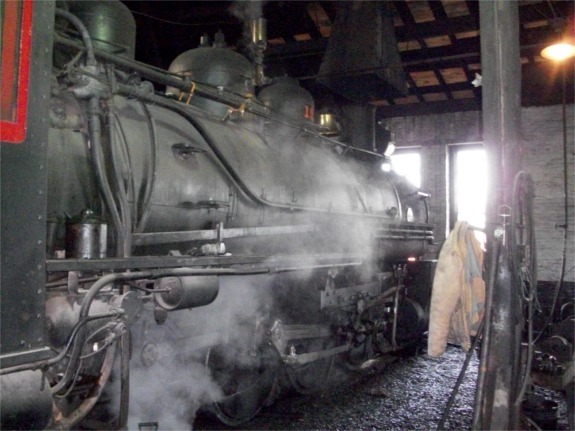 By the way, the material describing the Engineer for an Hour program indicates that one would have the opportunity to shovel coal into the firebox. I didn’t get to do that, which was fine with me. I imagined that trying to fire the locomotive would have provided the greatest opportunity for personal embarrassment. Besides, that’s fireman’s work. When the trip was over, I received a certificate testifying that I had indeed been Engineer for an Hour. My day with the EBT was memorable, and I would certainly commend the Engineer for an Hour program to any serious steam fan. There was one very odd thing about the day, however. I never introduced myself to the crew, and they never introduced themselves to me. I was changing the toilet paper in the bathroom of a friend with whom I was staying the other day. The thought suddenly struck me that the standard roll of toilet paper is not the ideal product for its intended purpose. Mostly, one does not use a single sheet of toilet paper, nor does one use connected sheets in a linear fashion suggested by their shape. Instead, toilet paper is usually wadded up in such a way that very little of its surface area constitutes what might be called the active area of the product. Why, I thought, is toilet paper the product that it is? (Perhaps all the recent tributes to Steve Jobs have caused me to think more about design than I usually do. The Wikipedia article on toilet paper reviews some of the alternative devices that have been used over the years, none of which seems the ideal mass-market product.) 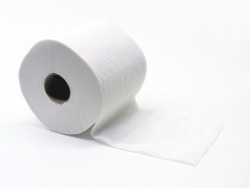 Toilet paper is made of a material whose primary characteristic is its disposability. Other characteristics—tensile strength, softness, etc.—are secondary but can be manipulated to some extent. The other significant characteristic of toilet paper is its packaging. The roll is easy to produce, is compact, and allows the product to be dispensed using simple and inexpensive appliances. Although the cardboard tube at the center of every roll creates significant waste, it may soon be eliminated, as Kimberly-Clark has devised a way to create toilet paper rolls without it. (See, for example, the USA Today story here.) As I mentioned earlier, however, what is dispensed is fundamentally the wrong shape. I am not an inventor or an industrial designer, so I do not have an alternative to propose as a replacement for the standard toilet paper roll. Perhaps the solution to the personal hygiene problem needs to be completely rethought. Perhaps toilet paper should be packaged in a different fashion. Perhaps the dispensing appliance could be altered. Here is one possibility: Perforate the paper into slightly longer segments, say, 8 inches. Devise a dispenser that folds these segments over one another. For example, one might begin with 2-ply paper and a dispenser that dispenses three folded segments, thus yielding a kind of 6-ply, 8-inch long “pad.” The number of segments in a pad could even be adjustable. In my recent post, “I Told You So, ” I suggested that the present disciplinary inquiry involving Bishop Mark Lawrence of South Carolina should have been seen as inevitable and that, frankly, Lawrence should never have been made a bishop to begin with. I take up the subject of Lawrence again in response to a comment from the Rev. Bruce Robison. I addressed some of the issues he raised in my own comment, and, in this post, I want to focus on the remarks of Bishop W. Andrew Waldo, to which my friend called attention. Bishop Waldo’s October 19, 2011, guest editorial in The State is “Unity, diversity both necessary and possible in Episcopal Church.” Alas, this essay exemplifies the kind of fuzzy-thinking, head-in-the-sand, collegiality-at-all-costs inanity that makes me wonder if having bishops is really worth all the trouble they seem to cause. …it is hard for me to see how the actions complained of against Bishop Lawrence rise to the level of an intentional abandonment of the communion of this church, as is charged. I have difficulty understanding why matters that are arguably legislative and constitutional in nature should be dealt with in a disciplinary context. Because The Episcopal Church does have a tradition of theological diversity, it generally shies away from heresy trials. (The radical conservatives are not so skittish about theological witch hunts, as the late Bishop Walter Righter discovered.) In fact, no one is pursuing charges against Bishop Lawrence for his theology, whatever that might be. We do, however, expect our bishops to “engage to conform to the doctrine, discipline, and worship of the Episcopal Church” (BCP, p. 513). In particular, we govern our church in a democratic manner, and the constitution and canons of the General Convention are to be obeyed, even by bishops. If a bishop does not approve of our governing documents, he or she is free to suggest changes at the next General Convention. Such advocacy is perfectly acceptable. Ours is a church of theological diversity, but not of trustworthiness diversity. The doctrine of The Episcopal Church is hard to pin down, but its constitution and canons are largely unambiguous. Although theological concepts, such as that of the Trinity, may be more “important” than “matters that are arguably legislative and constitutional in nature,” bishops are pledged to be trustworthy champions of the latter. “Diversity” in legislative and constitutional matters is insubordination, a refusal to play by agreed upon rules, a failure to keep a moral commitment. This is precisely what “should be dealt with in a disciplinary context” [emphasis added]. What kind of example is a bishop who pledges his sacred honor to uphold the rules under which our church has agreed to operate but who flagrantly disobeys those rules because he doesn’t like certain decisions the church has made? In John 15:12-13, Jesus makes an arresting proclamation about Christian unity: He commands that his disciples love one another as he has loved us. He tells us that such love means a willingness even to die for the sake of each other. This requires a deep trust in God’s providential hand in human events rather than in our own “rightness”—regardless of whether we lean right or left. I see no compelling reason why the church should make sacrifices for a bishop who believes he is above the mundane conventions by which the rest of us live our life together. No one is persecuting Bishop Mark Lawrence—not for his theology, not for his views on how the church should operate. It is not the duty of the church to accommodate a bishop who puts himself above the decision-making mechanisms established by the church. If Mark Lawrence cannot live within the parameters set by a democratic General Convention, he has an ethical duty to resign. Failing that, he must accept the consequences of what can only be seen as his transgressions. Bishop Waldo has failed to understand the essentials of the situation in which Bishop Lawrence has placed himself. 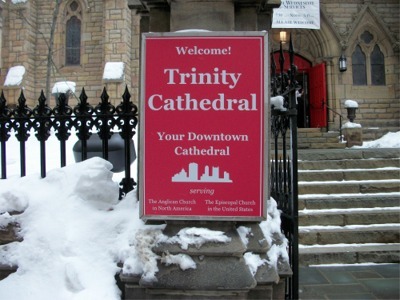 Whether Lawrence has abandoned the communion of The Episcopal Church is debatable—the canons are indeed unclear on just what this locution means. 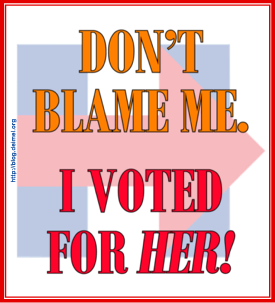 I have no doubt, however, that he has committed offenses deserving of deposition. The facts brought forward by the people of the Episcopal Diocese of South Carolina are not frivolous. Lawrence cannot blame changes to the South Carolina constitution and canons on his diocesan convention. As bishop presiding over the convention, he had the obligation to declare propositions clearly out of order to be such. He did not. In opposing the giving of consents to Mark Lawrence’s consecration, I titled my argument “No Consents: A Crucial Test for The Episcopal Church.” Having first succeeded, then failed in that test, the church has been presented by Mark Lawrence with yet another test of its wisdom and resolve. Perhaps it will succeed this time.